Will New Legislation Turn Kenya Into a Tax Haven? 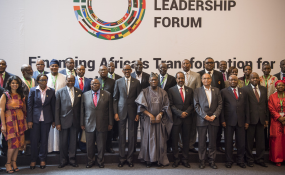 The 2018 African Leadership Forum kicked off on August 1. Kigali — Former President of Tanzania, Benjamin Mkapa has urged African leaders to be innovative in combating illicit financial flows by re-thinking their models of financial development in their countries. Mr Mkapa was speaking in Kigali, Rwanda, on Thursday August 2, during the fifth African Leadership Forum (ALF), that he organised. He said in order to confront the problem of illicit financial flows, it was important turn around complicity of financial institutions, customs systems, tax authorities and laxity of other state organs. "Governments should encourage innovation and private initiatives but not be an obstacle to enterprises," he said during the forum which is coordinated by UONGOZI Institute. There is growing evidence on the continent that illicit financial flows currently exceed overseas development assistance. Furthermore, leaders at the forum suggested reorganisation of economies, strengthening of country economies through supporting local enterprises and capacity of revenue institutions and regulations to curb illicit financial flows. Mkapa said no country should continue with the illusion that someone else would come from outside the continent to help transform economies. "This idea does not preclude working with the rest of the world, it means that we first stand strong and anyone can make partnerships with us but when we are already moving on ," he said. In his keynote address, Rwanda's President Paul Kagame said Africa can finance its own development through rethinking how regional integration can grow local economies and by government being enablers of local businesses as opposed to being obstacles. "Africa can finance its own development. Atleast a big part, no doubt. We know it because Africa finances other peoples' development," said Mr Kagame. He proposed that Africa can reach a turning point through accountability. "For example, on domestic finance, we have to build the trust that public funds will be spent on the right things, this is the foundation of good policies," he added. For his part, former Somalia President Hassan Sheikh Mohamud said the African continent is not at the same level of variables that lead to economic transformation in the sense that some states are still fragile and in some cases exporting conflict to other parts of Africa. United Nations Conference on Trade and Development Secretary General Dr Mukhisa Kituyi said global dynamics are such that each region will have to look inside itself to transform. Dr Kituyi said there was poor capacity of revenue authorities and challenges of transfer pricing and urged understanding of the morphology of the problem in order to confront it. Moreover, former Mozambique President Joachim Chisano noted that it was important for the current generation to understand the web of dependence they find themselves in so that they can have a turn around for the continent that confronted colonisation by itself. Former Nigeria President Olusegun Obasanjo said Africa should expedite its growth and outplay international systems that have been designed to make the continent weaker.